Texas A&M signed three of the nation's top 50 prospects. How have they performed thus far? Texas A&M landed the No. 11 overall recruiting class in the country in 2015, according to 247Sports rankings, and a number of its top prospects have already begun to see the field. With their first season on campus in the books, how have the young Aggies performed in limited action? Mack ranks right behind Beckner and Thompson as a run stopper at +8.2, though he has added little as a pass rusher (-3.0) on his 146 total snaps. 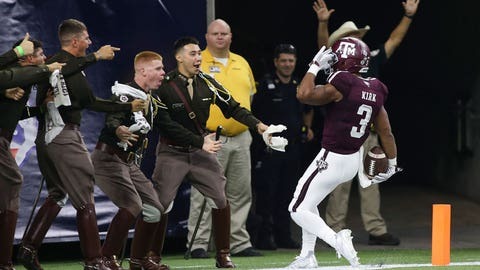 Kirk leads all true freshmen receivers in overall grade (+6.1), receptions (32), and yards (519), while his 334 yards after the catch rank fifth in the entire nation. He’s become an instant playmaker for the Aggies in both the passing game and as a runner, while also adding an explosive threat to the return game (+2.4). Backing up starter Kyle Allen, Murray has seen the field for 79 snaps, most of which came in Weeks 1 and 2. He’s completed 15-of-27 for 146 yards, throwing one touchdown and one interception, good for a passing grade of -0.9. As a runner, he’s picked up 116 yards on 12 carries, including 81 yards on five scrambles.